Netsparker enables you to schedule scans in advance. Both Full and Incremental scans can be scheduled. 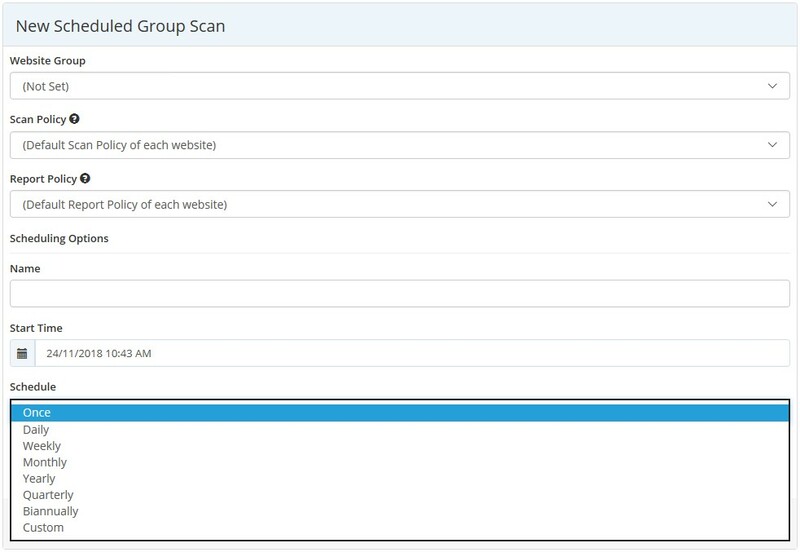 You can schedule one-off and recurrent scans, both individual scans and group scans. 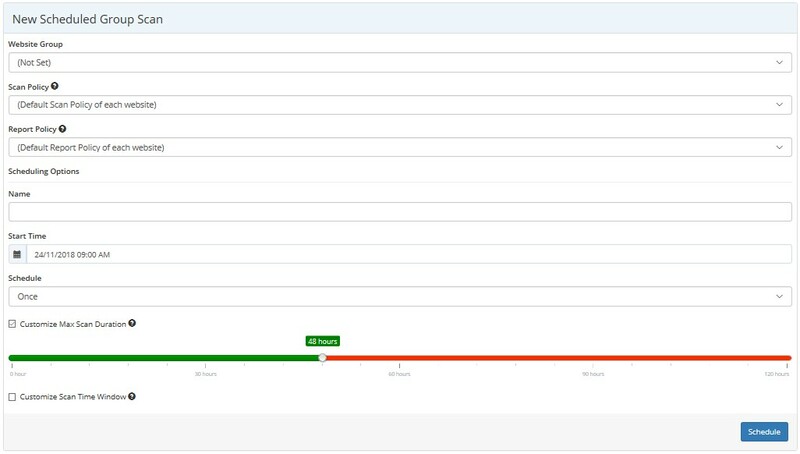 In Netsparker Standard, you can also send a web security report when a scheduled scan is completed. This table lists and explains the columns in the Scheduled Scans window. This is the name of the scheduled scan. This is the website or group name for the websites scheduled for scanning. This is the type of object to be scanned. This is the frequency of the scan. This is the time when the website was last scanned. This is the time in days, hours and minutes when the next scan in the schedule will take place. In Netsparker Enterprise, you can schedule any scan. This includes both full and incremental scans, as well as group scans. You can schedule a scan from any start time, and have it repeated on a fixed or customized basis. All the same options – such as fixing the maximum scan duration and scan time window – are available with scheduled scans. This is the start date and time of the scheduled scan. You can configure a bi-weekly schedule using the Custom option. From the main menu, click Scheduling, then Scheduled Scans. The Scheduled Scans window is displayed. From the main menu, click Scheduling, then Schedule Scan. The New Scheduled Scan window is displayed. In the Scan Type field, select Full (default). In the Start Time field, select the date and time. From the Schedule dropdown, select the required option. Complete the remaining Scan Options. In the Target URL field,enter the URL, including the path. 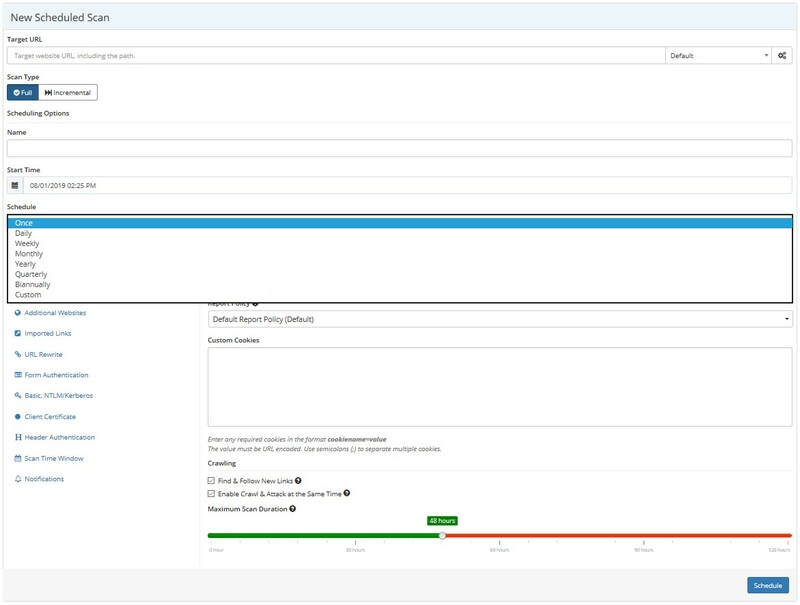 Complete the Scheduling Options as explained in How to Schedule a Full Scan in Netsparker Enterprise. From the main menu, click Scheduling, then Schedule Group Scan. 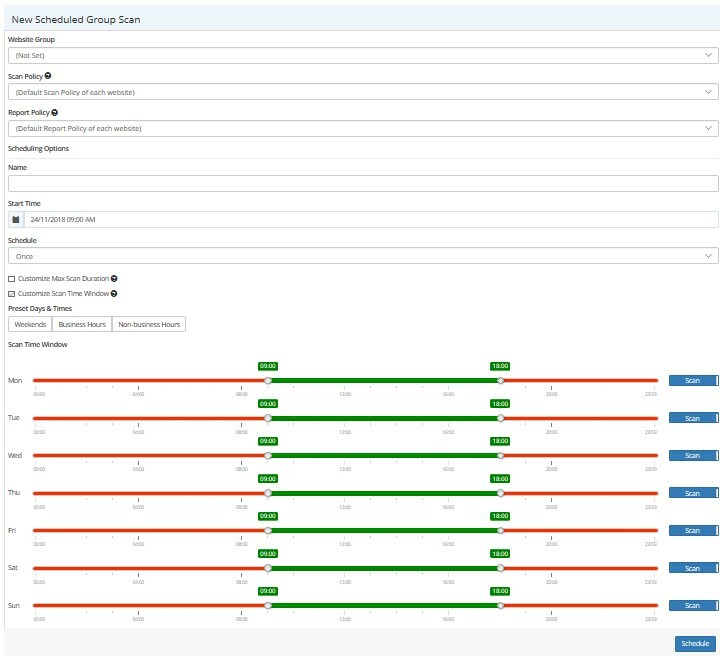 The New Scheduled Group Scan window is displayed. Enable the Customize Scan Time Window checkbox, if required. 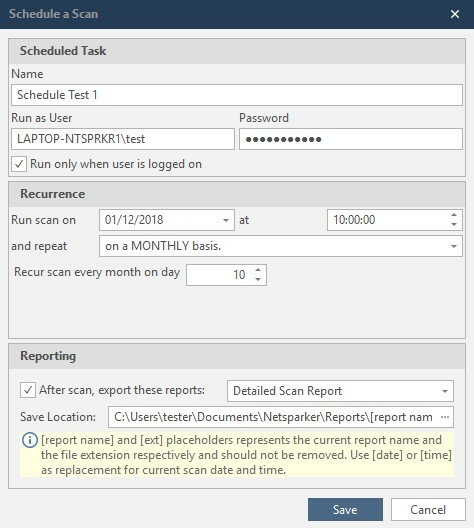 In Netsparker Standard, you can schedule any scan. This includes both full and incremental scans, as well as scans on new or multiple instances of Standard. You can restrict a web security scan to run during a specific time. 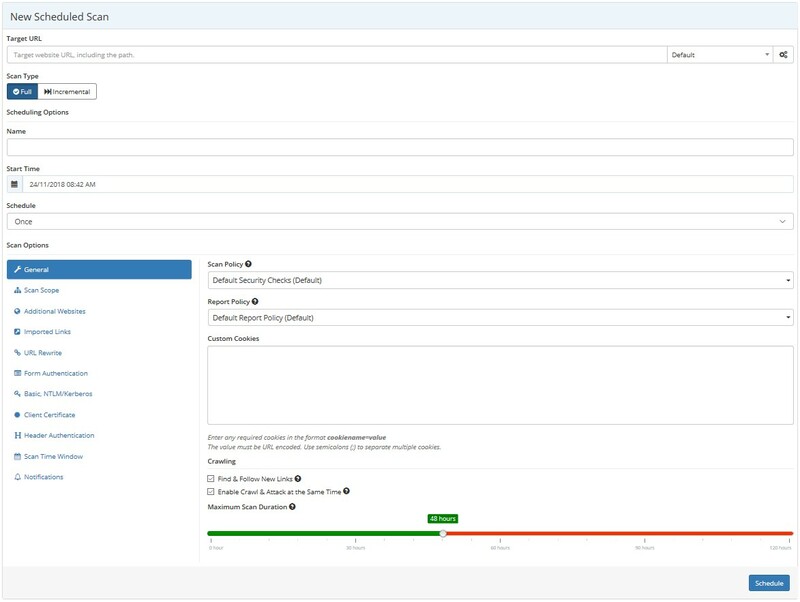 Additionally, Netsparker Standard allows you to configure and send automated web security reports on completion of a scheduled scan. From this drop down, you can select one of Netsparker's predefined scan profiles, or your own saved profiles. From the ribbon, click the Home tab, then Schedule. The Schedule a New Scan dialog is displayed. Complete the Schedule a New Scan dialog. Click Schedule. The Schedule a Scan dialog is displayed. Enable the Run only when user is logged on checkbox, if required. Enable the After scan, export these reports checkbox to activate scan exports, then from the dropdown, select which type of Report to export. In the Save location box, enter an alternative location, if required. Otherwise, the report will export to the default location on your local machine (C:\Users\[username]\Documents\Netsparker\Reports\[report name] (Default-[date][time]).[ext]). On the Home tab, click Schedule Incremental. The Import dialog is displayed. In the Import dialog, select the filename of your already completed scan and click Open. The Schedule a New Scan dialog is displayed. From the Schedule Scan dropdown, click Schedule Scan. Download and install AutoHotkey, an open source utility that can be used to find the running instance of Netsparker Desktop, and trigger the keys that resumes and pauses scans. Download these AutoHotKey scripts, which will be used to pause and resume the web security scans. 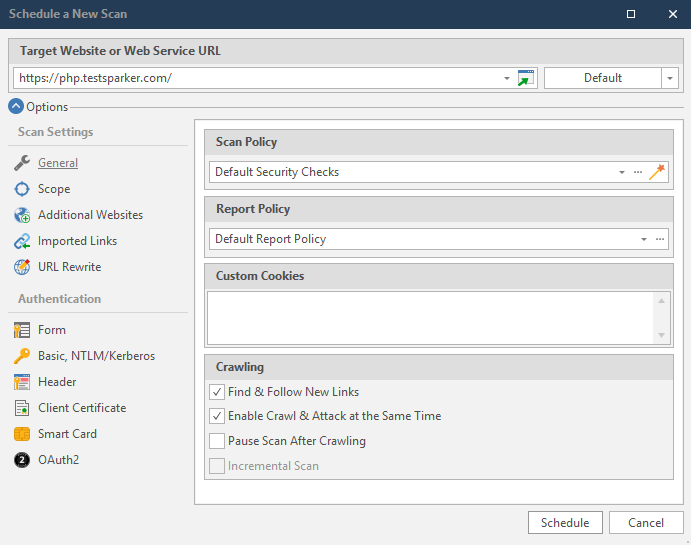 Configure all the scan parameters (such as Target URL, Scan Policy and Reports Policy). Pause the scan as soon as it starts. The scan will be resumed automatically when the first scheduled task starts, and if it is not finished by the finishing time, it will be paused automatically by the scheduled task. You should have a single instance of Netsparker Standard running. If you have more than one, the AutoHotKey scripts will work only one that you’re running, not necessarily the one you want to resume/pause. Once a Scheduled Scan has been completed, you can email a web security reports. This is done using Window's Powershell scripting, which automatically emails an attachment on completion of a Scheduled Scan. Download the files ScanAndMail.ps1 and urls.txt files from Netsparker. Copy the files ScanAndMail.ps1 and urls.txt files to the Netsparker installation folder on your local machine. Open ScanAndMail.ps1 with a text editor and specify the SMTP server and mail settings from lines 3 to 11. Open urls.txt with a text editor, and specify the URL of the web application you would like to scan and the path of where to save the scan report, separated with a semicolon. To scan multiple websites, specify the same parameters for each website in a new line. The installation folder of Netsparker Standard in a 32 bit Window installation is C:\Program Files\Netsparker.